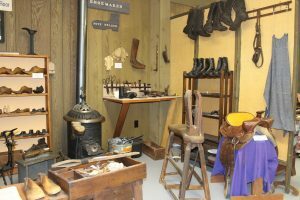 This Cobbler’s Shop is very much like the shop that “Shoemaker Pete” had for many years here in McFarland. The cobbler’s bench where he sat and worked, the shelves full of forms and lasts used in making and repairing shoes, the cutting shelf on which to cut the leather into parts to be hand sewn together to make the shoes, the many varied and odd tools, and the coal burning stove are all typical of his shop. 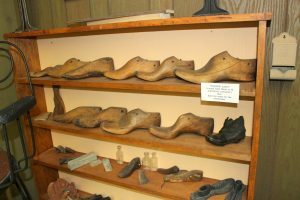 A shoemaker made wooden lasts of a person’s feet. Using them, he made shoes for that person, and usually had that customer for many years. Mail order shoes were available in the 1880’s and ready-made shoes in stores became popular in the early 1900’s. These were constant competitors for the local shoemaker. The shoemaker usually did the repair work. A community of 300 could support one shoemaker and this was the population of McFarland while Pete was shoemaker. Peter F. Nelson, commonly known as “Shoemaker Pete,” was born in Norway in 1851. He learned the shoemaker trade in 1870, at the age of 19, working for his brother in McFarland before he even learned the English language. 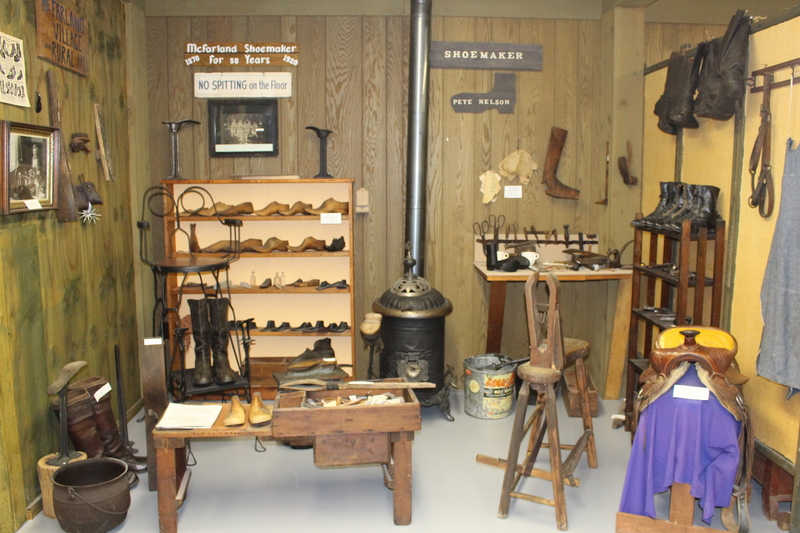 He later had his own shoemaker’s shop on what is now the McFarland Historical Museum’s side yard at 5814 Main Street. Pete operated his shoe shop until about 1919. Young Erling Olson who lived across the street was allowed to watch him at work but not allowed to ask questions because Pete usually had a mouth full of nails! Peter was married in the 1870’s to Esther (Astrid) Olson. They raised eight children, owned a home on Lake Street, and spent their retirement years in McFarland. Peter died 24 January 1930 at the age of 78 and was buried in McFarland.